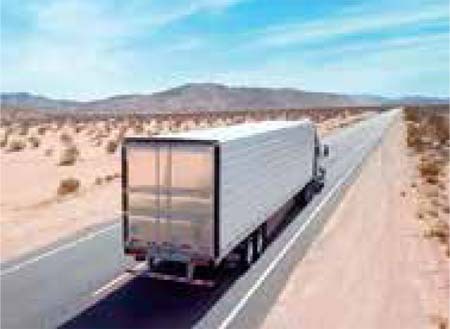 CITY OF INDUSTRY, Calif.—A new aerodynamic device designed and engineered by Utility Trailer Manufacturing Company is said to work in combination with other components to help increase the fuel efficiency of trailers. The patented Utility Aerodynamic Tail (UAT) weighs only 25 pounds and is compatible on dry vans and refrigerated trailers with rear swing doors, the company said in a press release. Engineered and tested to meet strict Utility operational requirements, the Utility Aerodynamic Tail is constructed of a UV-protected thermoplastic composite and comprises two full-height side fairings and one full-width roof fairing. When paired with low rolling resistant tires and configured on a Utility dry van or reefer, the combination of the Utility-designed Aerodynamic Tail and Side Skirt is designed to reduce fuel use and aerodynamic drag. The side fairings are connected to the rear swing doors. Using standard opening procedures for the rear swing doors, the UAT automatically deploys when the doors are closed and folds back when the doors are open. No additional driver involvement is necessary. The roof fairing does not interfere with lock rods or rear light areas and meets all DOT Photometric requirements, the company said. Utility Trailer Manufacturing (www.utilitytrailer.com) is a manufacturer of refrigerated trailers and dry freight vans, flatbeds, and Tautliner® curtain-sided trailers. The company makes all its own CARB (California Air Resources Board) and Canadian EPA (Environmental Protection Agency) compliant aerodynamic devices.